Use anywhere you need to stop water flow! The Single Brass Connector Shut Off Valve is rugged and tough piece that allows you to stop water flow where ever you need it. 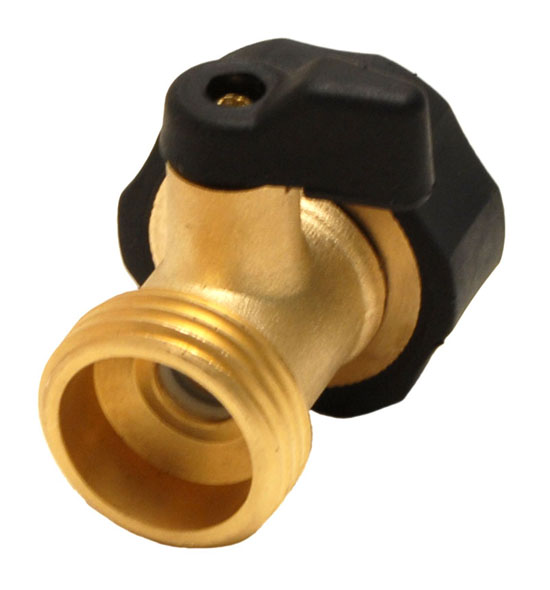 Use this Single Brass Connector Shut Off Valve between your hose and your water nozzle or foam gun. Twist the over sized brass knob to stop water flow and disconnect or swap washing tools with out running back to your spigot. The Single Brass Connector Shut Off Valve is also a great tool for connection two hoses together inline. The Single Brass Connector Shut Off Valve has extra large handles for easy grip when operating. The solid brass construction is extremely durable and can withstand hot water temperatures. An Easy-On swivel connector allows the hose to rotate once attached, helping to prevent the hose from kinking. if you have a foam sprayer this is a great item.